HBO’s hit show Silicon Valley has been commended for its realistic portrayal of the real Silicon Valley, but this is a little too perfect. The latest season of the show tried to poke fun at the valley’s obsession with extending lifespans through Hooli boss Gavin Belson, who (spoilers ahead) is shown employing a “blood boy” to keep him supplied with fresh supplies of blood. The “blood boy” is described as someone out of a “Nazi propaganda poster”, and Belson regularly transfuses his blood into his own body to make sure he lives to the ripe old age of 120. 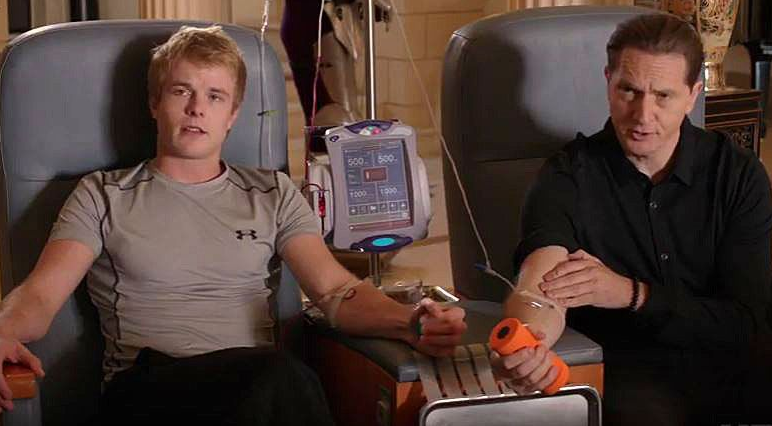 It turns out Belson’s blood boy wasn’t a figment of a Silicon Valley writer’s imagination — a startup is actually offering blood from teens to people who want to fight aging. And it has a hundred paying customers. Ambrosia is a secretive, California-based startup which has been performing blood transfusions for people since 2016. Volunteers have their veins pumped with plasma, which is blood with its blood cells removed. The plasma comes from from teenagers and young adults under the age of 25, and Jesse Karmazin, its 32 year old founder, says that within a month, most participants “see improvements” from the one-time, 2 liter infusion. There’s little scientific evidence to back his claims — most studies around the subject have proven to inconclusive, and Ambrosia is the only company in the US that commercially performs such procedures. Karmazin isn’t licensed to practice medicine, but has degrees from Princeton and an MD in Medicine from Stanford. He says he started the company after reviewing research into whether injecting older mice with the plasma portion of young ones can improve memory. The scientific community has been largely skeptical. Scientists told MIT Technology Review that Karmazin’s trial is so poorly designed it cannot hope to provide evidence about the effects of the transfusions; some have even said it amounts to a scam. But Ambrosia has managed to evince interest from some big names — PayPal founder Peter Thiel has been following Ambrosia closely, though Karmazin says he isn’t one of their customers. Ambrosia, for its part, has been happy being under the radar. It has the strangest website ever, with a simple picture of Sequoia trees in a forest, no contact information or address, and three tabs. The About tab simply has one line “Founded in 2016, Ambrosia studies the effects of transfusions of young blood plasma.” The Science tab links to a variety of papers about their technique, and finally, a tab allows interested users to give the company their email and phone number so they can be contacted. Micracle cure or scam, one thing’s for certain — nothing Silicon Valley writers come up with can compete with the madness that’s the real Silicon Valley.